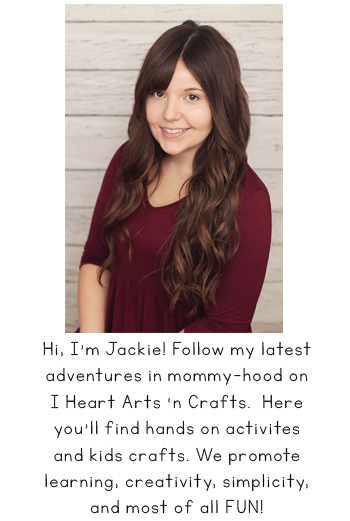 This review was made possible by iConnect: Influencer Management and Pampers. I received product free of charge, but all opinions are 100% mine. All moms know hitting the gym after kids is not a simple task, actually even just heading out the door isn’t a simple task anymore. So I’ve had to get creative with my workouts and start doing them at home, but what’s even better is when your baby or toddler can actively engage in on the fun. 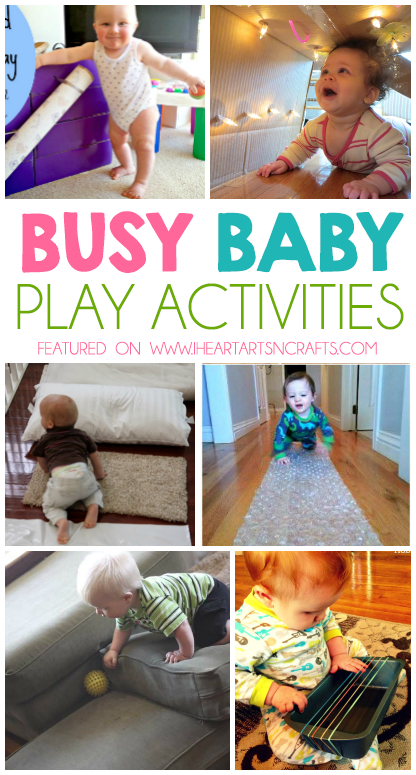 Babies and toddlers love to stay busy so why not use some of that energy on some creative mommy and me activities that will help with bonding, muscle development and fine motor skills (and sneak in a bit of a workout too!). Rock out with your baby – One of the most popular activities with my kids is dancing, so why not make some of your own instruments and have a jam session. You can make up your own nursery rhyme workout with “Five Little Monkeys”, “If You’re Happy and You Know it”, or use one like this rhyming workout here. This would also make a great play date activity! Make an Obstacle Course – There are a ton of different ways to create your own obstacle course. Some ideas could include a Texture Trip, a simple obstacle course for crawlers, or a fun a sensory tunnel using household objects. Bubble Wrap Run (or crawl) – My daughter loved this when she was a crawler and even more now that she’s walking. 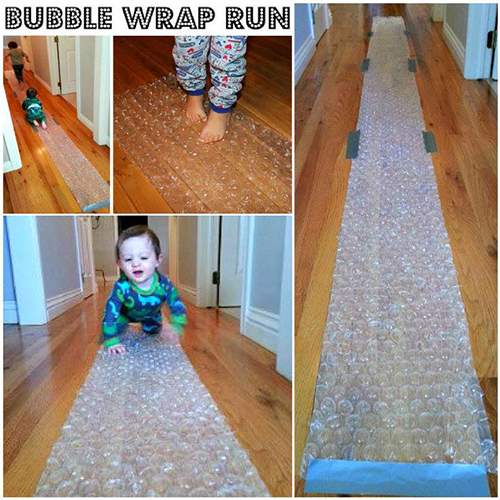 Simply tape down a long strip of bubble wrap and let the kids go crazy and run, jump, and crawl! They love hearing all the noises that they can make. 4. Toddler and Baby Yoga – If you’re first introducing your child to yoga you can have them imitate you doing simple movements to slowly build their skills. 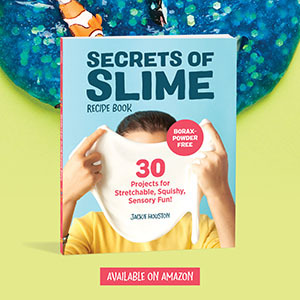 There are a ton of amazing resources out there for child yoga like books, websites, and videos. But we found what’s really fun is joining a class so they can join in with other kids. If your child is younger and not crawling or walking yet, they mommy and me classes for every age and is a great postpartum workout! 5. Ball and Tube Play – This is an easy activity that you can set up in your home. I like to do this one when I’m doing my yoga ball workouts, squats, or kettle ball lunges. When my kids were younger they would imitate me picking up the balls when I would pick up my kettle balls. This is great for color recognition and fine motor skills. With your active babies you want to make sure that they can move and play freely, which is why we use Pampers Cruisers. They recently went through some exciting changes! The diaper will now feature three new “Extra Absorb ChannelsTM” in the diaper’s core which helps distribute wetness evenly so it stays drier and doesn’t sag like ordinary diapers. 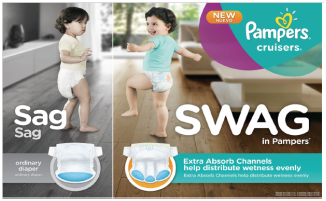 Pampers Cruisers still provides up to 12 hours of protection to help baby stay drier – plus the new channel design will reduce sag. As a result, babies can move, play and explore their world with a comfortable, better fitting diaper. The new Pampers Cruisers will give baby the freedom to move and play in their own unique way, bringing out their own one-of-a-kind SWAG! Mom testers of this new diaper felt that it helped keep their babies on the move. 89% said that it reduced bulkiness between the legs, and 91% found that it locked wetness evenly. And even though the design of Pampers Cruisers has changed, the diapers are made from the same safe and mild materials as before and feature fun Sesame Street® character designs. And because Pampers supports the happy and healthy development of each baby, Pampers will make a diaper donation at each Pampers Cruiser stop, continuing the brand’s mission to provide millions of diapers for families in need each year. 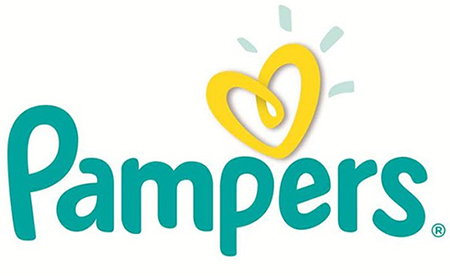 Connect with Pampers on Facebook, Twitter, YouTube and their website.